The Snackmaster Express features 500 watts of drying power that generates maximum speed and quality for dehydrating fruits, vegetables, beef jerky, and venison jerky. 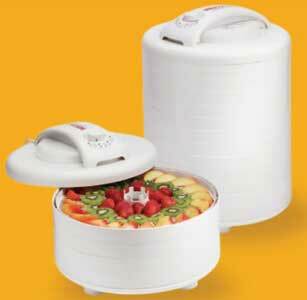 Helps dry food in hours, not days like ordinary food dehydrators. The adjustable thermostat allows you to dry different foods at proper temperature 95-155 degrees, providing the flexibility to produce the best drying results. The top-mounted fan prevents liquids from dripping into the heating chamber. 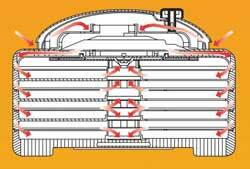 Patented Converga-Flow drying system forces air down the exterior pressurized chamber, not through the trays, then air is forced horizontally across each individual tray, converging on the core for fast, even and nutritious drying. There is no flavor mixing and no need to rotate trays. Top mounted fan and 500-watts of drying power generate maximum speed and quality for dehydrating fruits, vegetables, and jerky. 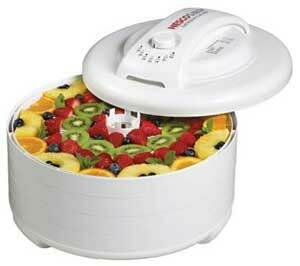 Helps dry food in hours, not days like other food dehydrators. 2,100 RPM fan. Comes with 4 trays; can operate with up to 12 trays. Drying pressure automatically adjusts to the number of trays in use. Easy and economical way to make delicious fruit snacks, vegetables, herbs and beef jerky at home. Allows user to dry different foods at their proper temperatures. Provides even heat distribution, so no need for rotating trays. Flavors won’t mix. Helps block harmful light and retain vitamins and minerals. Because of the unique design of the patented Converga-Flow system of your NESCO/American Harvest dehydrator, you’ll be surprised at how quickly most foods dry. Drying times may vary, depending on the type and amount of food, thickness and evenness of the slices, percentage of water in the food, humidity, temperature of air, altitude Keep records to help you predict drying times for specific foods. 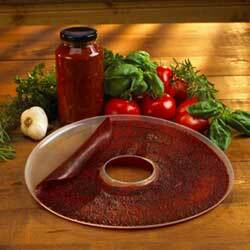 Fruits, fruit rolls and vegetables should be dried at 130 degree F to 140 degree F (55 degree C to 60 degree C). By drying foods in this temperature range you will minimize the loss of heat-sensitive vitamins A and C. All foods sweat when they begin to dry, the temperature may be set higher than 140 degree F (60 degree C) during the first couple of hours of drying. The actual temperature of the food will remain 15 degree F to 20 degree F (6o to 8o degree C) lower than the air temperature for the first couple of hours. 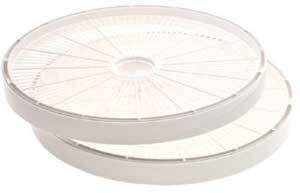 Meats and fish should be dried on the highest temperature setting of your dehydrator. These temperatures also keep bacteria and other spoilage micro-organisms, common to meat and fish, to a minimum during the first stages of drying. Nuts and seeds are high in oil, and if higher temperatures are used, they will tend to become rancid, developing off flavors. The best temperature is from 90 degree F to 100 degree F (30 degree C to 40 degree C). Herbs and spices are most flavorful when they first open and should be harvested while very fresh, before they begin to blossom. Because the aromatic oils are very sensitive, temperatures should be 90 degree F to 100 degree F (30 degree C to 40 degree C) for drying. Take care not to load trays too heavily as this will prolong the drying time. Dried flowers, herbs and spices used for potpourri should be dried at temperatures ranging from 90 degree F to 100 degree F (30 degree C to 40 degree C) to maintain aroma and color. Fruit rolls are a favorite snack for young and old alike. It is a chewy fruit product made from pur�ed fresh fruit, which has been dried and rolled into snack sized pieces. Most fruits canned or frozen also combined with others. Some fruits, such as apples, are high in pectin and fiber, and have an excellent texture when dried. Use fresh fruit in season. You can also use slightly overripe fruits, irregularly shaped fruits, or slightly bruised fruits that would be unsuitable for canning or drying. Some fruits, such as citrus, should be used in combination with other fruits because they have so much liquid and very little pulp. If you find that a fruit is too runny, combine it with apple, applesauce or a similar fruit that will give it more substance. When fresh fruits are not available, canned fruits or frozen (either sweetened or un-sweetened) can be used. Simply drain the liquid, and pour the fruit into the blender. 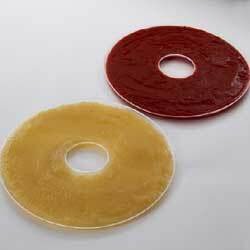 Applesauce can be taken directly from the container for wonderful fruit rolls. Jerky is a favorite snack for school, lunch, on the trail or just about anywhere. It is made by seasoning lean, raw meat in a salt mixture, then drying it without cooking. The finished product is a protein-rich exercise in chewing and ever so delicious. Jerky also makes a savory broth base for soups and stews. Jerky may be made from a variety of wild game meats, fish and poultry. Use filets of fish and the breast of chicken. You can make delicious jerky from ground meat, using the NESCO/American Harvest Jerky Works TM kit. It’s best to use ground round or lean (or extra lean) meat. Season with NESCO/ Harvest Jerky seasoning mixes. A: The process is very simple. Increasing the temperature of food makes its moisture evaporate. Air moving over the food carries the moisture away. Controlling the temperature and air circulation prevents food from spoiling while it is drying. If sufficient water is removed from the food, micro-organisms and enzymes that would make the food spoil are disrupted. 2. Q: How do you know when foods are dry? A: Always let foods cool for a few minutes. Check to see if the food is still moist or sticky. If it is leathery and pliable, it is usually done. However, foods that are over dried may become brittle and turn brown. 3. Q: If I powdered my dried vegetables, what could I use them for? A: Powdered onion and garlic, of course, are great seasonings for meats and sauces. Powdered tomatoes can be reconstituted into tomato sauce, paste, catsup, juice or soup. A blender or food processor will give you the finest texture. Store in air-tight container. Try making our own lemon zest, pepper flakes or corn meal. 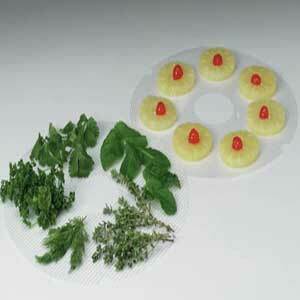 Clean-A-Screen for Drying Sticky Foods and Herbs4. Q: Will flavors mix if I dry different foods together in the same dehydrator? A: If you dry foods in the same category, such as fruits with other fruits and vegetables with other vegetables, the flavors should not mix. However, we do not recommend drying onions with any other foods. 5. Q: What are the benefits of food drying? Nesco FD-60 Snackmaster We bought a Snackmaster, Jr. about twenty years ago and never had any problemwith it. It finally died. So we looked for another one and we found this one.The air and heat comes from the top of machine and circulates around the food that is being dried. It seems to dry the food faster than the old one and it is mucheasier to clean. We really like it so far. Good value I purchased this dehydrator so I could take advantage of the fresh produce that is about to be in season in our area.This is the second dehydrator I have owned. My first, a different brand, had no temp. control and the heat/fan unit was in the bottom. I hated the thing. The food wouldn’t dry evenly even with tray rotation. This Nesco drys from the top and drys more evenly. I still rotate the trays but do not have to do it as often.The only issue with this unit is like with most of the dehydrators out there, the drying tray ventilation spacing is to wide for some foods. I suggest buying the Clean-A-Screen inserts to use when drying foods that will shrink up a lot.Overall I really like this dehydrator and would purchase another in the future if I cannot afford a more expensive unit.